The exhibition Frida Kahlo: Making Herself Up is currently at the Victoria and Albert Museum in London and we recently took the chance to visit. This unique show gives a detailed overview of Kahlo’s life: her family and heritage; her politics; her relationship with mural painter Diego Rivera; the near-fatal accident that caused her a lifetime of pain; and most importantly, how she constructed her image and the way in which she lived her life. Kahlo’s home in Mexico, La Casa Azul (The Blue House). 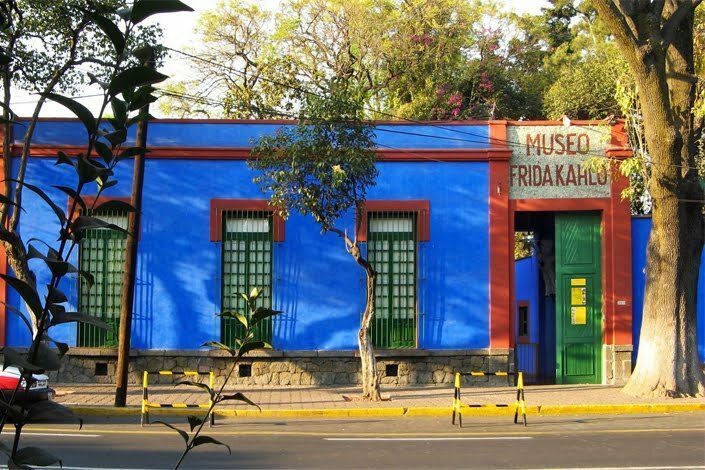 Upon Kahlo’s death in 1954, her husband Rivera locked up her most valuable possessions in the bathroom of the Casa Azul (The Blue House, their home in Mexico) and instructed that it not be opened until 15 years after her death. In 2004 this bathroom was opened, and the contents of the room went on display at the Casa Azul as a museum dedicated to her life. These objects are what now fill the exhibition space at the V&A, carefully shipped thousands of miles to be shown outside of Mexico for the first time. 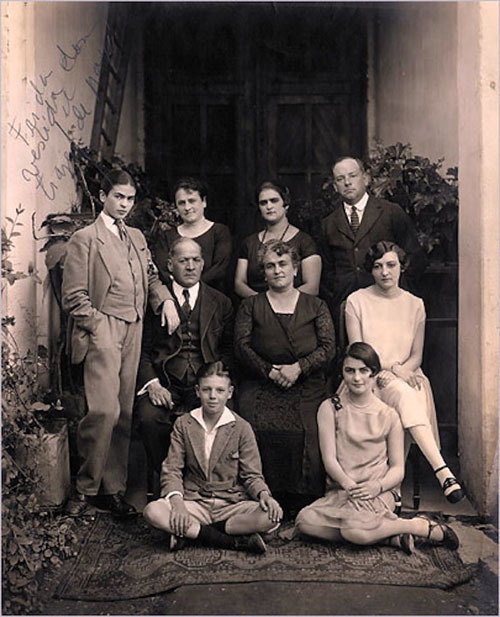 Frida Kahlo and Family, 1926, photograph by Guillermo Kahlo. Kahlo challenges gender stereotypes by wearing a suit. The exhibition begins with old photographs of Kahlo and her family, some of which are adorned with Kahlo’s handwritten notes. Some simply label family members, whereas others are more personal: for example, on the back of Kahlo’s Communion photo she has scrawled “¡IDIOTA!” as she renounced Catholicism later in life. 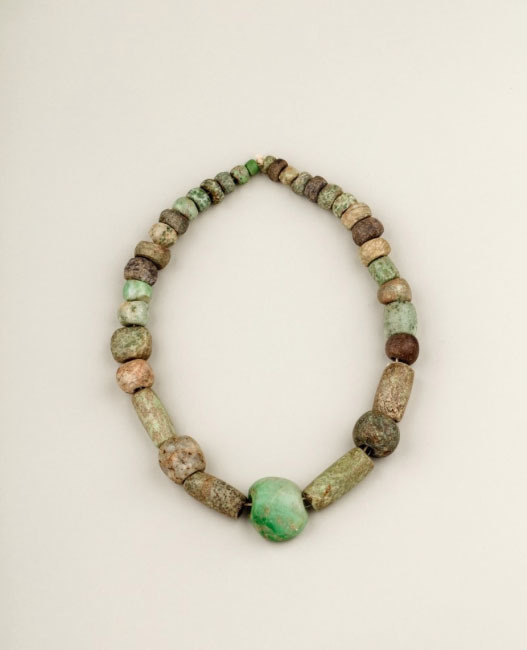 Pre-columbian jade beads, possibly assembled by Frida Kahlo. Museo Frida Kahlo. The show continues through a series of rooms to Kahlo’s accessories: heavy jade necklaces; crescent earrings featuring paired birds, which are traditional of Mexican jewellery; and hand-woven ‘Rebozo’ shawls and ‘Morrale’ sack bags. 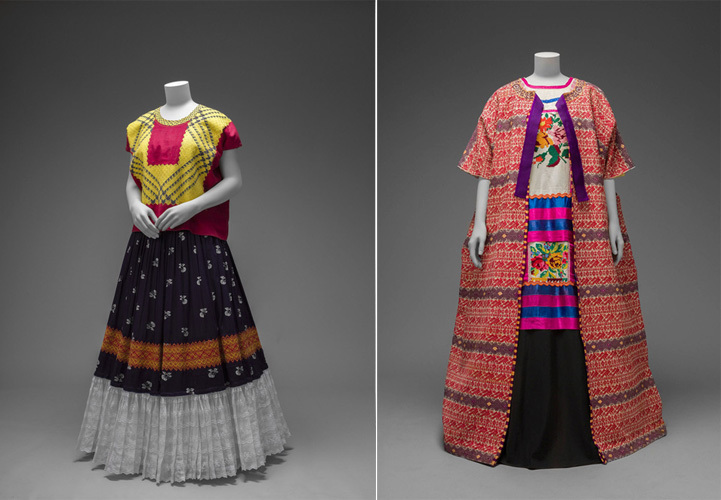 These items highlight Kahlo’s pride in her Mexican heritage. 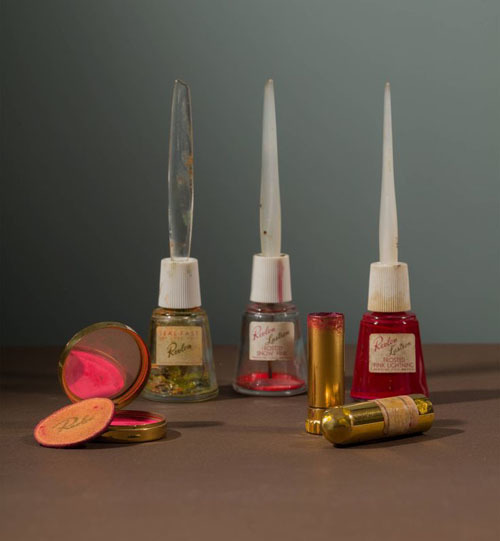 Revlon nail varnishes, compact and lipstick in Kahlo’s favourite shade, ‘Everything’s Rosy’. We then move on to Kahlo’s possessions, perhaps one of the most personal parts of the exhibition. Intimate items are on display such as used lipsticks and empty medicine bottles accompanied by letters to and from her various doctors. 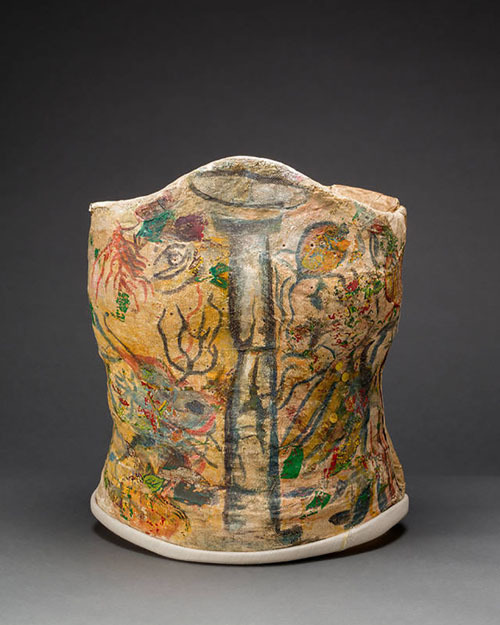 Plaster corset, painted and decorated by Frida Kahlo. Museo Frida Kahlo. Kahlo’s suffering due to childhood polio and a car accident at the age of 18 lies at the foundation of some of these objects. For most of her life she wore uncomfortable corsets to help support her back and alleviate pain, some of which were made of plaster and decorated with painting as Kahlo used them like a canvas. Left: Cotton Huipil with chain stitch embroidery, cotton skirt with printed floral motifs. Right: Guatemalan cotton coat worn with Mazatec Huipil and plain floor-length skirt. Finally, the main feature of the exhibition is a stunning display case of Kahlo’s clothing. 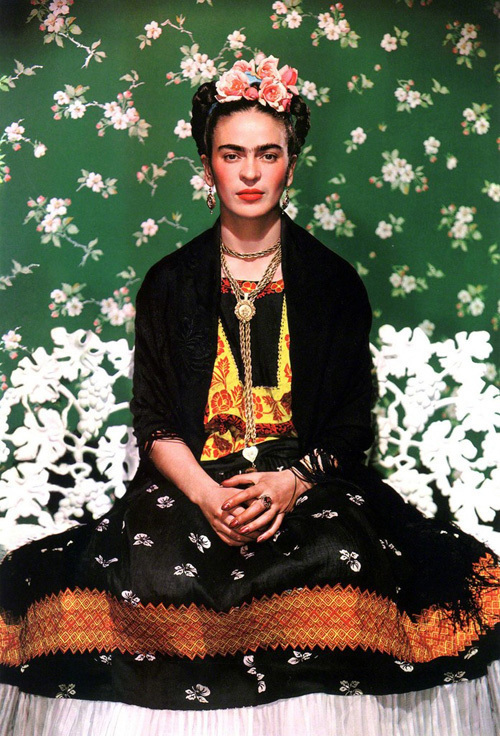 Kahlo is renowned for her combinations of indigenous garments from different regions of Mexico, and she was photographed in such outfits many times. To see them up close in real life is breathtaking. 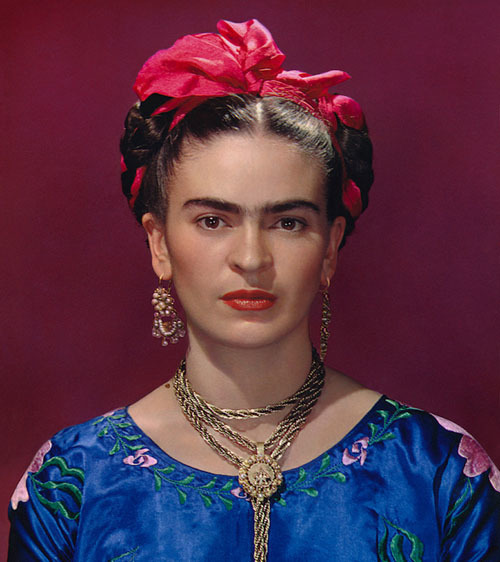 Detailed embroidery is present in most of the outfits, from complexly shaded flowers and birds to cross stitch to traditional Chinese embroidery (due to Kahlo’s fascination with Chinatown when she moved to the USA with Rivera). The exhibition gives details of her most striking outfits, describing how she was followed by children when in the USA, who asked “Where is the circus?”. 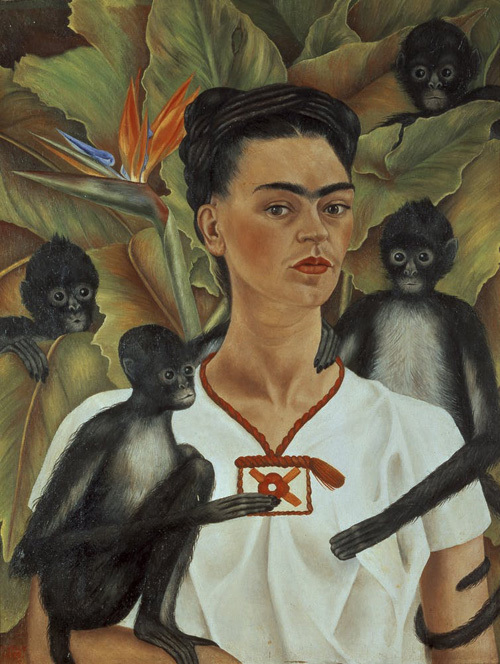 Self Portrait with Monkeys, 1943. Oil on Canvas, 81.5 x 63cm. There are some of Kahlo’s paintings – mainly self portraits as she used herself as a subject when painting from her bed – but the exhibition mainly focuses on Kahlo’s items and how she presented the complex layers of her identity within her life. It states that her wardrobe was not staged: she dressed up even when she wasn’t expecting visitors, and even when she was in bed rest. Frida Kahlo on the Bench, 1939. © Nickolas Murray Photo Archives. Frida Kahlo: Making Herself Up is a bewitching and intimate exhibition. The items on display are fascinating, and through them the personal details of how Kahlo naturally lived an artistic life – despite her misfortunes and pain – are revealed. A must-see for anyone interested in textiles, and anyone interested in Frida Kahlo’s complex and inspiring life. Purchase tickets at the V&A website here. 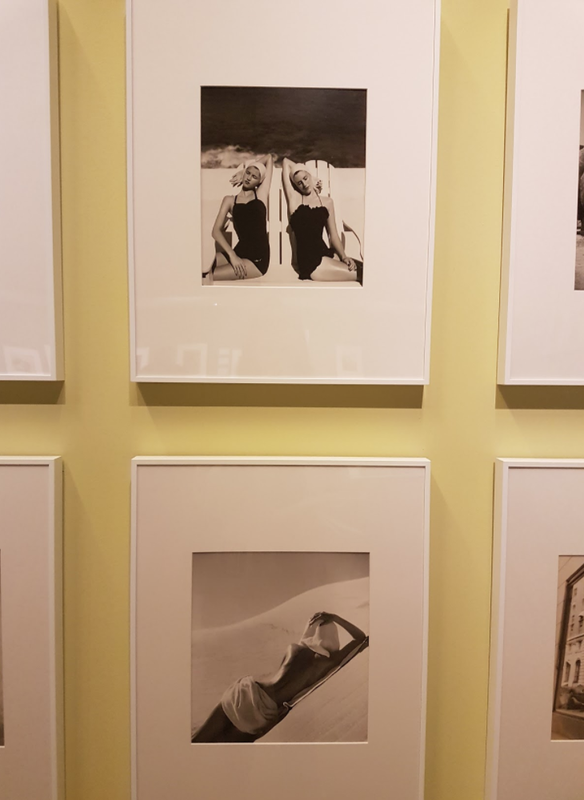 The Fashion and Textiles Museum, London, has just opened an exhibition dedicated to Louise Dahl- Wolfe, an American photographer who is credited with modernising fashion photography. The exhibition spans the the whole of the long gallery as well as part of the upper area. It looks at Dahl-Wolfe’s early works and how she defined the image of the post war women. It has over 100 photographs on display which some contain the work from various designers such as Chanel, Balenciaga and Dior. Located in the long gallery, you must first pass a room on the left which currently has a small display of work from Wallace Sewell, who designed the upholstery fabric for Transport for London, continuing on you walk through a corridor of Dahl-Wolfe’s colour Harper’s Bazaar covers and enter a large open space full of beautifully framed photos. The airiness of the room allows the work to breath and gives you space to enjoy it. The gallery displays mainly black and white image from Dahl-Wolfe’s career as well as a selection of coloured work. Dahl-Wolfe trained in San Francisco’s Art Institute in 1914, and it was here that she took classes on anatomy, composition and colour theory fundamentals. These proved to aid her later in life when starting out in photography. Dahl-Wolfe’s first photo to be published, Mrs Ramsey, was in Harper’s Bazaar’s November 1933 issue. Mrs Ramsey was Dahl-Wolfe’s neighbour when her and her husband moved to Tennessee. As with a lot of Dahl-Wolfe’s photos there is an element of calmness about them whilst simultaneously displaying the soul and character of her subject. Dahl-Wolfe started working at Harper’s Bazaar from 1936 until 1958. During this time they published 600 coloured photographs, 3,000 black and white images and 86 front covers taken by the artist. During her Hollywood period, 1938-1946,Dahl-Wolfe shot on her Rolleiflex camera using natural lighting and had her models posing outside, providing an alternative to the “clever lighting and retouching”1 that was already apparent within the industry. Even within the black and white photos Dahl-Wolfe took, the texture and material of the clothing still stood as as one of her key focal points. This was achieved by clever set dressing and good use of composition within the photographs. Continuing through the exhibition it looks at Dahl-Wolfe’s era within Fashion photography, 1938-1949. When Dahl-Wolfe started, fashion photography was still among its early stages, this meant that there was room to develop and evolve the practice. Took in a variety of settings including Arizona, California Desert, North Africa and Mexico Dahl-Wolfe’s photos erd towards simple compositions that compliment the Dior and Balenciaga dresses. Dahl-Wolfe had a knack for capturing her subjects unaware and in seemingly natural movements. Mary Jane Russell, who was one of the most successful fashion models of her time, worked with Dahl-Wolfe for over 12 years, producing 8 Bazaar covers and 100’s of editorials and adverts. 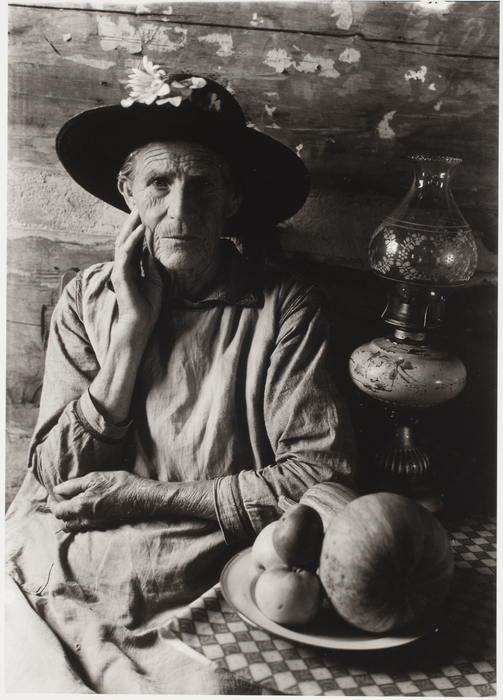 The exhibition has a good amount of information spanning Dahl-Wolfe’s early career and through to her retirement as a photographer. It is running from 20th October- 21st January 2018 at the Fashion and Textiles Museum, London. Prices are £9.90 for adults, £7.70 concessions and £6 for students (Remember your Student ID). All images and videos courtesy of Charlotte Pearson (@c_textiles) unless otherwise stated. Louise Dahl-Wolfe- A style of her own, Fashion and Textile Museum. Pamphlet pg.3. 2017.